If I were a dish instead of a person, or even a dish named after a person or a person named after a dish, I’d really like my name to be Bibimbap. It sounds enough like “this and that” to make and keep a promise of the versatile, freeform wonders of Korea’s single most famous dish. 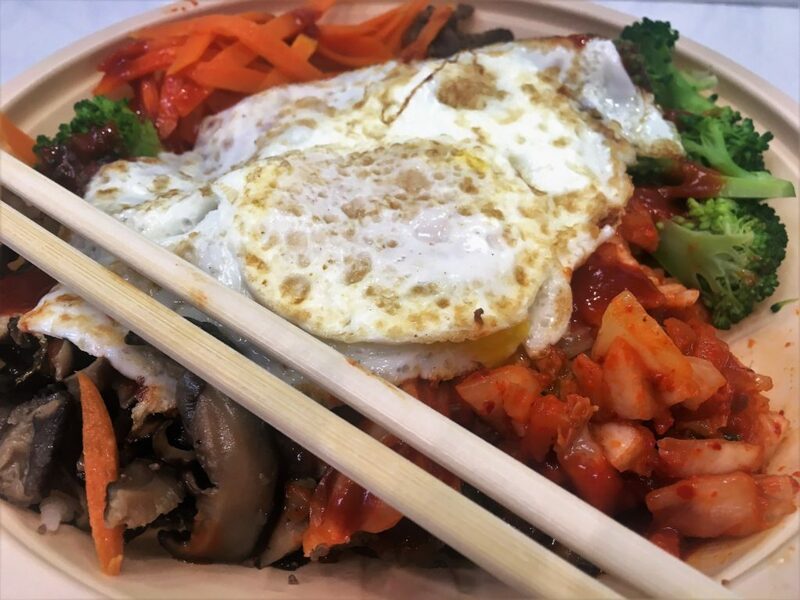 If all you know about Korean food is from late-night reruns of MASH, then you might be tempted to think that honor belongs to kimchi – the cabbage that Koreans traditionally ferment in clay jars buried in the yard. Indeed, kimchi has a place in the recipe that follows. And if you’ve been to Korean food trucks and brick-and-mortar restaurants around this ethnic food-loving country of ours, you might think it’s the steak “barbecue” known as bulgoki. Yet essentially, that appears in the recipe too. No, whatever your level of familiarity, bibimbap (arguably the most accepted of the several spellings) is Korean food personified. It involves beef and it involves rice, and it usually involves kimchee. Most interestingly, it evolved in the 20th century (in restaurants) away from a rustic mixed-up dish of rice-with-whatever into a colorful bowl of changing components that each diner gets to mix for himself. Korean restaurant owners discovered that people in this country, and even in Korea, have a blast getting all wrapped up in what feels like making their own dish. As a food with multiple origin stories – its creation credited to the Korean royal court as far back as the 14th century OR to farmers in the countryside throwing together a quick and easy meal, or to an Asian New Year tradition of using up old ingredients – bibimbab has many variations as well. And that means by region, by season and, yes, even by class. In all cultures, eating a dish loaded with beef requires you to afford such a dish. But springtime in Korea also tended to bring on all-vegetable or lighter seafood versions. We’re not entirely sure how far back the fried-egg-on-top tradition goes, though it does seem to predate the current chef silliness of placing a fried egg atop practically anything. We like pretending the tradition belongs to bibimbap alone. And historically, it just might. Before the start of the 20th century, which in its middle years was quite unkind to Korea, the same basic dish was known for an unknown number of centuries as goldongban. As a dish cooked at home, it came to be associated with farmers, who appreciated its mix of nutritious meat and vegetables with lots of cheap steamed rice. According to food historians, all the items were once mixed up to make a container of goldongban – a bit like fried rice in the Chinese tradition. It was only in the 20th century that Korean restaurants came into popularity. Goldongban became bibimbap and also started waiting for the diner to mix it up. It has become wildly popular in the United States, especially with a nudge from Korean food trucks. In 2011 CNN Travel named bibimbab one of the world’s 50 most delicious dishes. Nothing delivers a more authentic Korean flavor in a bigger hurry than a sauce made with gochujang, a different and more intense version of soy. To go along with popular modern tradition, keep the components separate in the bowl and let diners mix up their own. They will enjoy the experience – and the great taste. Combine the first 4 ingredients with the thinly sliced beef. Let marinate in a bowl for at least 30 minutes. Heat 1 tablespoon oil in a large cast-iron or nonstick skillet over medium heat. Add rice; pat out in an even layer. Cook, rotating skillet for even browning (do not stir), until rice is golden and crisp on bottom, about 15 minutes. Meanwhile, heat remaining oil in a large heavy skillet over medium heat. Add one-quarter of beef and cook, turning once, until cooked through and lightly browned, about 3 minutes. Transfer to a bowl. Repeat in batches. Divide rice among bowls. Top with beef, Bibimbap Mix-Ins, and top with eggs. Serve kimchi alongside. Serves 8.